An immensely powerful long range unit. Critical hit when on beach. Warships are water units attack at long distances. They're available to recruit from a Port. When they're positioned on a beach while attacking they'll perform a Critical Hit. Warship Cherrystone Kingdom Whilst Cherrystone's Warships are built at home by skilled shipwrights, they're manned by Merfolk from the Circle Sea. So attuned are the Merfolk to the movements of the sea that they're able to send theirs ships dancing amongst the waves with eerie grace. Warship Felheim Legion Felheim's Warships are built and manned by Deepfolk from the Circle Sea. The Deepfolk harvest wood from the coast of Dragon's Cradle, haunling it into the water and constructing the ships in the ocean itself. The Deepfolk possess a bioluminescent stalk, and at night, the decks of Felheim Warships seem alive with ghostly lights. Warship Heavensong Empire Superior technology has long made Heavensong's naval force the most dominant in Aurania. Heavensong Warships are strong, fast, sturdy and so simple to control that only a small crew is required. Just a single gunner can man all three of the Warship's forward cannons. Warship Floran Tribes The Floran build their Warships from the remains of pirate ships that wash up on Plunderer's Coast, patching up their hulls with clumps of moss and vines. 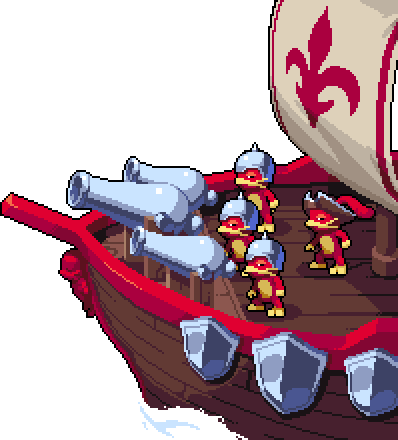 They are manned by large crews of boisterous Floran, who clamber nimbly around the decks, somehow managing to manoeuvre them as if they were far more seaworthy vessels.